The past has a funny way of looping back around to land firmly in the present. When we think of time capsules we think of recorded voices on cassette tapes; thumb drives chock full of information spanning millennia; a velvet poster of Elvis Presley or an original taping of the moon landing, all buried in concrete beneath the earth or tucked away in some official storage facility in Pennsylvania. But sometimes the past is written with a fine-tipped fountain pen on robin’s egg blue paper by a Frenchwoman to her little sister in September of 1920. I stumbled across this vintage missive in December of 2009 while on the hunt for a Christmas present for my artist stepmother. Stopping into one of my favorite boutiques in my hometown of Ashland, OR, I knew I was bound to find something at Prize, the chic storefront owned and curated by Jennifer. The shop is gorgeous from floor to ceiling, featuring everything from antique diamond necklaces to a library of vintage James Bond novels and contemporary children’s books. Between bags of pastel-colored candies tied off with gold ribbon and lavender saché pillows handmade in Provence, I happened upon a glass bowl filled with an array of old letters. As a writer and as a history lover, I could not resist the allure of vintage stationery. 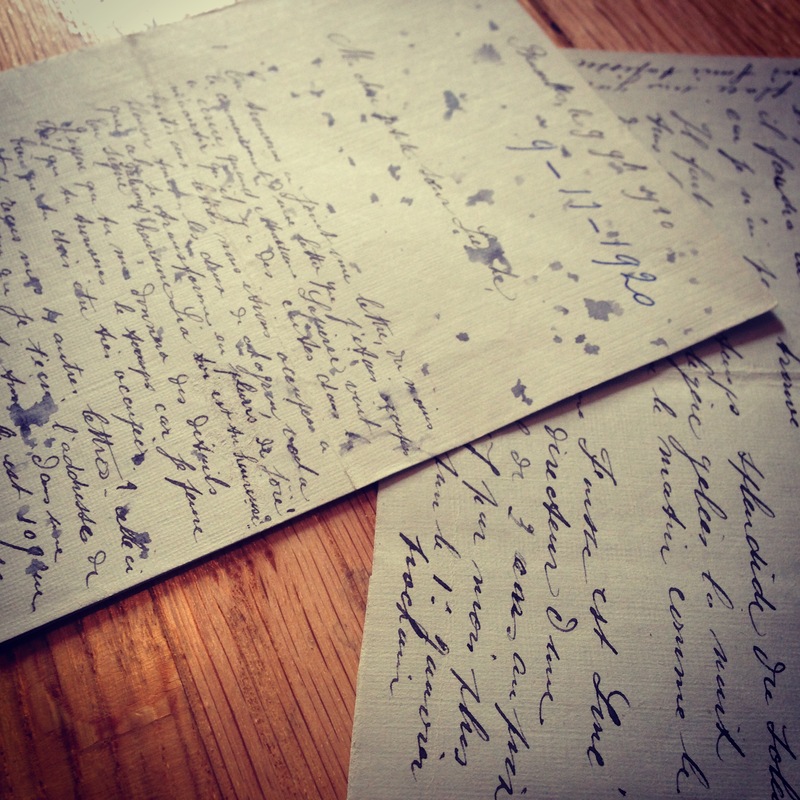 Upon closer inspection – and to my continuing delight – I found myself facing a treasure trove: Jennifer had brought back from a recent trip to Paris an assortment of handwritten letters from the turn of the 20th century. Most were near-mint and absolutely stunning. I selected two for purchase; one I kept, and the other – written in an elegant script on soft rose pink paper – I gave to my stepmother to use in her future art projects. The letter I have kept for the last five years was eighty-nine years old when I bought it in 2009. Now approaching its 100th birthday, I have only managed to translate a smattering of words, but the contents of the letter written to a sister seem inconsequential compared to the existence of the letter, itself. To have something as beautiful as this finely penned letter (written, I’d like to think, on a rainy spring day in Paris, in the early afternoon over an espresso served in a gold-rimmed ceramic cup) in my possession feels like owning a snapshot of history told in words, an elegant and mysterious time capsule brought into the present still bearing the love and care of the writer nearly one hundred years later. Share your own letters from the past on Instagram and be sure to tag @dempseycarroll. We would love to see your letters, notes, and post it-notes!